One of the joys of photography is getting to share a place, or a feeling, that you love with everyone else; that comes at a cost though when you contribute to destroying that place. I am not tarring everyone with the same brush at all, but I am fed up of watching photographers, or anyone for that matter, hop over “please stay on the marked trails” signs to get “the best Instagram shot” or one without trees, or plants blocking the view. Whether you’re in your home country, or abroad, it’s not uncommon to see signs asking you to stay on the marked trail to protect wildlife and vegetation. Some signs might even explain that it’s humans trampling everywhere which has damaged the area and it needs time to recover. Perhaps the signs need to be bigger because I watched countless people ignore them. 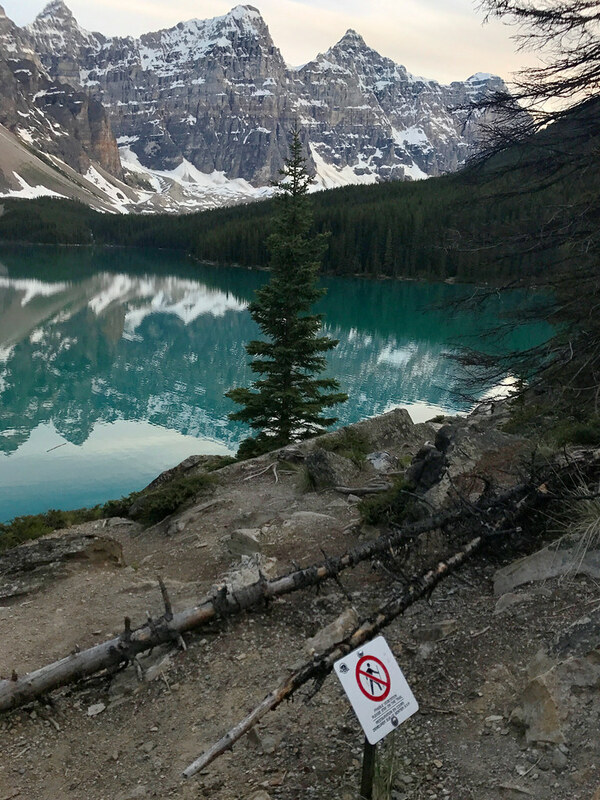 These signs are all over the place in Canada, and by far, the worst place for offenders was Moraine Lake. A few kilometers outside of Lake Louise, the beauty of Moraine Lake is beyond words. It is our favourite place, which makes it even harder to watch people contribute to damaging it. If you’ve never been to Moraine Lake, let me explain the best view point to you. There is a huge pile of rocks which a path, steps and view points have been built into, which give you a beautiful elevated view of the lake. The problem some photographers seem to have is that there are trees growing in and along this rock pile, which “get in the way” of your view sometimes. So, what do they do? They step off the trail and clamber all down the banks. I saw so many people do it without even hesitating and it made my blood boil. It is absolutely possible to get a view of the lake without trees “blocking” the view by staying on the path, and the trees really are part of the environment and part of the view so why are we so into getting rid of them? As well as damaging the fragile environment, Daz brought up an excellent point; taking photos from viewpoints off the trail encourages others to do the same to replicate the shot. Honestly, how many times have you seen a photo and thought, “wow, I’d love to see that view with my own eyes?” I’ve done it loads, and I am always so disappointed when I get somewhere and realise the photographer strayed off the trail to get that shot. That kind of disregard sends a message that it’s ok for others to do the same, whether the photographer realises it or not. We witnessed more than enough people show complete disregard for the protection of the places we visited so people honestly do not need the encouragement. Our environment is fragile and one of the privileges of photography, for me and others, is that we get to share the beauty of our planet with others and highlight the importance of protecting it. But we’re nothing short of hypocrites if we are doing things as simple as straying the marked trail to get a “better” shot. Please, stay on the fudging trail because protecting fragile places is more important than Instagram likes.